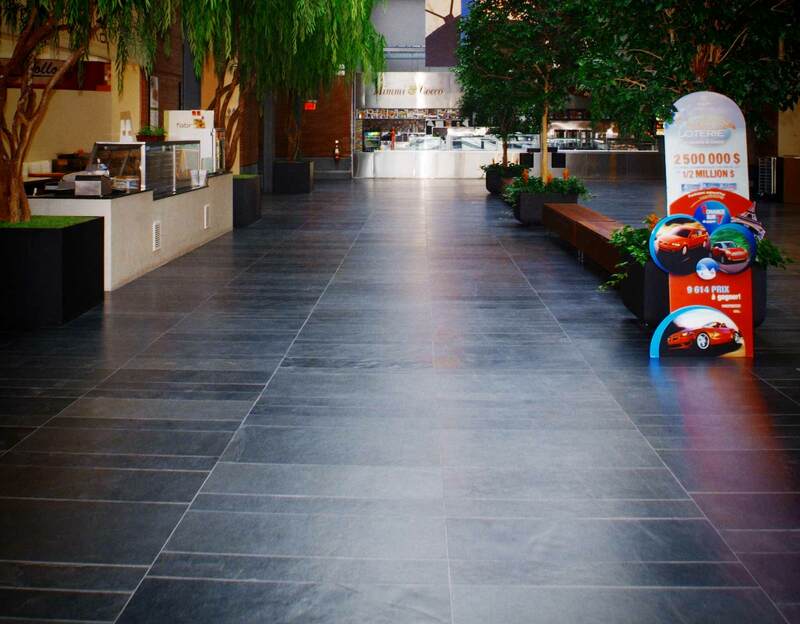 The 1350-1360 René-Lévesque West's ATRIUM is located in the heart of downtown Montreal, close to the Lucien L’Allier Metro station. Strategically located, the ATRIUM is equipped with HVAC and state-of-the-art control systems ensuring optimal comfort that is second to none. The floors made of natural slate and its own majestic atrium create a warm and inviting atmosphere that is completely adaptable to any event. It is with great pride that The 1350-1360 René-Lévesque West was awarded the distinguished BOMA BESt level 3 certification by BOMA (Building Owners and Managers Association). The 1350-1360 René-Lévesque West reiterates its commitment towards the protection of the environment in everyday business by adopting responsible management practices which are supported by concrete actions to make this commitment a true mission. This is not only a statement; it’s a way of life. The 1350-1360 René-Lévesque West is abreast of the latest technology and needs, thus providing organizers with the perfect layout to host green events. 8,000 square feet in an “L” shape including one section of 5,170 square feet and a second one of 2,830 square feet. 400 people in a “banquet” or “cocktail” set up. The possibilities at your disposal to suspend lighting, sound equipment, decorations and even artists from the horizontal structure (firm steel structure) of the ATRIUM or from the steel pillars create a spectacular visual effect for any event - which promises to be highly colourful. The ATRIUM horizontal structure (low parts): 3 suspension points for a maximum capacity of 100 lbs each. Steel pillars: up to 1,000 lbs using a cable system attached to the pillars. For maximum efficiency, The 1350-1360 René-Lévesque West’s technical staff will make sure all of your electrical needs are met while always abiding by the Quebec Building Code. The 1350-1360 René-Lévesque West offers an extensive electrical capacity thus offering a wide range of possibilities. We invite you to contact us to learn more about the possibilities at your disposal. The loading dock offers a capacity of five 26 feet long by 12 feet high trucks, simultaneously. Each of the five docking stations is equipped with a dock leveller. Two service elevators are accessible from the loading dock leading directly to the ATRIUM. The ease and rapidity in accessing the facilities are key assets to the organization of any type of event. Furthermore, a 7,000 square feet storage area is also available. The 1350-1360 René-Lévesque West offers highly advanced security services to its users. Security agents are posted 24/7, ensuring a constant surveillance of the complex and the control access system. The complex offers superior quality services ensuring the well-being and the comfort of the occupants. Additional courteous and discreet security personnel is required for any event taking place at the ATRIUM. Kindly contact us to obtain our security service rates. Because all successful events are held in a clean and impeccable environment, the management team and the housekeeping team will inspect the area before the equipment installation process begins for every event. We also offer the possibility of having courteous and discreet housekeeping personnel at your disposal during your event in order to offer an impeccable environment to your guests. Furthermore, cleaning after the event will be performed by the housekeeping team at The 1350-1360 René-Lévesque West. Kindly contact us to obtain our housekeeping service rates. 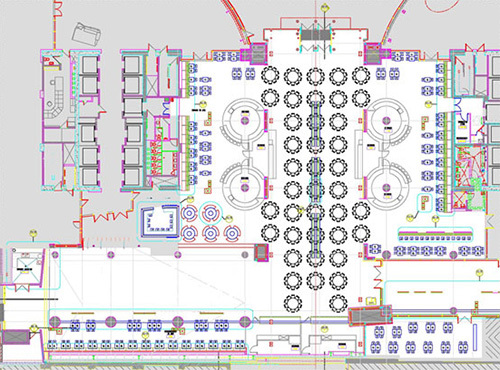 Caterers will benefit from a 2,300 square feet reserved area adjacent to the ATRIUM to manage their team and ensure the quality of their food. The purpose of suggesting these caterers is to control the quality of service offered during an event – being focused on the quality of the food as well as on the efficiency with which the space reserved for the installations is managed. As well, it ensures the compliance of security guidelines. The event organizer will have the option to work with the audiovisual specialist of their choice. However, management reserves the right to review the choice of specialist. The choice of one of two audio-visual specialists below will provide a quality event and the implementation of safety devices properly and can perform the technical integration efficiently and professionally and in a short period of time. Below you will find a plan of the Atrium. Of course this is but only one example of the many different ways you can arrange the Atrium to meet your needs. © 2017 GWL Realty Advisors Inc.